Zimbabwe opposition leader Morgan Tsvangirai has left hospital in a wheelchair after allegedly being beaten in police custody on Sunday. He told the BBC that the government had miscalculated, as it was seen more than ever as a "rogue regime". In the UK, Foreign Office minister Lord David Triesman told the BBC Zimbabwe's government had committed "actions... bordering on crimes against humanity". Zimbabwean leader Robert Mugabe has said Western critics should "go hang". He blamed the violence on Mr Tsvangirai's Movement for Democratic Change (MDC). The two MDC factions have meanwhile announced that they will now work together. Their 2005 split is widely believed to have greatly weakened their struggle against Mr Mugabe. The two MDC leaders shared the platform for the first time at Sunday's rally and both men were subsequently arrested and allegedly assaulted. "We let down Zimbabweans in 2006 by bickering and name-calling among ourselves," said Tendai Biti, a close ally of Mr Tsvangirai. Mr Tsvangirai strongly denied being involved in any violence and urged Africa and especially South Africa to increase pressure on President Mugabe. UK Foreign Secretary Margaret Beckett has said she holds Mr Mugabe personally responsible for Mr Tsvangirai's injuries. "He is in charge of the government, he's made it very clear that this is a deliberate act of policy on behalf of the government of Zimbabwe, he is indifferent I think to the real horror that's felt right across the international community," she told the BBC's Politics Show. Lord Triesman pointed to the government's suppression of the MDC and the eviction of hundreds of thousands of people from urban areas in 2005 as possible crimes against humanity. He dismissed calls for military intervention in Zimbabwe but supported calls for those responsible for assaulting Mr Tsvangirai and some 50 other MDC activists to be identified and added to the list of those subject to an EU travel ban and assets freeze. The US says it is also considering extending its sanctions on Zimbabwean officials. Mr Tsvangirai was arrested together with colleagues after police broke up a banned rally on Sunday. He appeared in court two days later with a badly bruised face and stitches in a head wound. However, doctors deny reports that he suffered a fractured skull and say he has suffered no permanent brain or scalp damage. 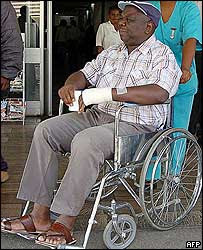 His spokesman, William Bango, said Mr Tsvangirai was still in pain. Four other MDC officials remain in hospital. Speaking after a meeting with Tanzanian President Jakaya Kikwete on Thursday, Mr Mugabe said there had been no Western criticism of the MDC, which he said had instigated the violence. Kwame Nkrumah: From pan-African visionary to one-party state dictator? Peluola Adewale looks back on the legacy of one of Africa's most famous political leaders. The independence of Ghana on 6 March 1957 was a watershed in the history of Africa, being the first in black Africa. It was a catalyst in the struggle for liberation from colonial rule on the continent. For the African masses one man's stood out, Kwame Nkrumah. Inspired by the independence of India from Britain in 1947, he saw the possibility of defeating imperial Britain with coordinated and consistent political struggle. He thus became a quintessential anti-colonialist. His return to Ghana and formation of the anti-colonialist Convention Peoples Party (CPP) gave radical impulse to the independence struggle and set the stage for the exit of the British colonialists. Unlike the current generation of African leaders who are mostly only satisfied with earning foreign exchange from the sales of natural resources and self-enrichment, Nkrumah was genuinely committed to using the resources of Ghana for industrial development and economic growth. Ghana was rich in bauxite which could be used to manufacture aluminum, even for exports if there were a reliable power supply. This together with the need to produce electricity for industrialisation informed the Volta Dam project. The project was only half-succeeded, but nobody could reasonably doubt the positive intention behind it. Nkrumah openly asserted that capitalism was too complicated to achieve the goals of development. But beyond the rhetoric of anti-capitalism and scientific socialism in his celebrated speeches and writings, he never truly cut links with capitalism and imperialism. His socialism was based on the Stalinist Soviet Union model and a utopian African version. This was the undoing that made it impossible to achieve his lofty goals. For instance, his government relied on a bureaucratically run marketing board - a colonial invention - to mobilise the required resources from the sales of cocoa, the country's economic mainstay. This created a more enabling avenue for official corruption than the provision of basic needs and infrastructure development that it was originally designed to achieve. Nkrumah set up state owned companies and public utilities, apparently to provide some basic needs for the people. But lack of democratic management and control of the companies by the workers themselves bred crippling mismanagement and corruption. They did not only fail to largely achieve their objectives, they became a curse rather than a blessing. Since Nkrumah could only use the revenue from cocoa to bail out public companies, he had to sacrifice poor farmers. The government, through the market boards, reduced the price paid to farmers for cocoa in order to raise more revenue. This was at a period when there was an increase in the price of cocoa on the world market, and farmers expected fortunes. They were thus highly disappointed and demoralised. This culminated in a series of events that made Ghana lose its place as the world's largest producer of cocoa. The economic downturn created a social crisis that made the government of the self-styled Osagyefo ('the Redeemer') - the once hope of Ghana and beacon of Africa - unpopular. The government's response to the various worker agitations worsened the situation. Rather than mobilising workers and the poor to break completely with capitalism, Nkrumah became dictatorial and took draconian measures against the widespread protest and disaffection to his government. Unfortunately, Nkrumah who had once proclaimed during the anti-colonial struggle, 'if we get self-government, we will transform the Gold Coast (Ghana) into a paradise in 10 years', almost turned the country into hell for workers and opposition alike. He declared strike actions by workers to be illegal, arrested and detained opposition without trial, and declared Ghana a one-party state with him as life president. There remains no doubt that Kwame Nkrumah was one of the greatest African nationalist leaders. The military coup in 1966 that dethroned him, provided him the opportunity to give more speeches and writings on Africa's development. He was a pan-Africanist, par excellence, with a radical and socialist flavour. However, Nkrumah was not a fully rounded Marxist. This limitation largely contributed to his inability to actualise his objectives and goals. Their limitations notwithstanding, Nkrumah and his kindred spirits still tower above the current generation of African leaders who have rolled back, the gains of the 1960s that saw massive investment of public resources in developmental projects. The rapacious colonialists refused to develop the continent despite sitting on its fabulous wealth. They only provided infrastructure that would aid exploitation of the resources of the continent. This placed enormous responsibility on the new African leaders after the independence to begin the process of necessary development and develop a welfare state. The idea of a welfare state, built on the Keynesian theory of state interventionism in the economy was fashionable globally in the period after the independence. In the present era of neo-liberalism the current corrupt leaders of Africa have embarked on the shameless sale of the patrimony of their nations, built with public resources, to the rapacious capitalists locally and internationally. The new set of African leaders has bastardised the original idea of African solidarity, championed by Nkrumah and others. They have come up with initiatives such as the New Partnership for Africa Development (NEPAD) designed to rely on the exploitation of Africa's resources in the service of the West, and the anti-poor neo-liberal economy, as vehicles for development. With this vicious, anti-poor, pro-capitalism, it is no surprise that the idea of Nkrumahism, despite its limitation, has remained alluring to many individuals, genuinely interested in the development of Africa. It is possible to state that the shortcoming of an Nkrumahist welfare state was not due to the personal failings of Nkrumah; rather that it arose from his attempt to seek improvement and development within the confines of capitalism. Africa is the weakest link of global capitalism. Here a revolutionary movement could start, with international working class solidarity, that could defeat capitalism and imperialism. Kwame Nkrumah in his speech, 'I Speak of Freedom: A Statement of African Ideology', spoke of economic cooperation and political union among African countries as the viable means of bringing about full and effective development of the continent's natural resources for the benefit of African people. This statement is still largely relevant today. But to be truly valid, and achieve the desired objectives, such economic cooperation and political union was intended to be built on genuine socialist programme that aimed at formation of socialist confederation, if possible, a federation of Africa in solidarity with the working class internationally. This together with discovery of the first-hand ideas of Marxism as taught by Marx, Engel, Lenin and Trotsky should be the task of workers and poor masses in Africa.